We carry on moving towards gvSIG 2.2 with a new add-on that allows working with legends by scale (also with labels, but we’ll see that in another post). The plugin is called Complex Legend extension and, as usual, we can install it via the Add-ons Manager, indicating the URL installation from the drop-down testing repository (Testing gvSIG repository – http://downloads.gvsig.org/download/gvsig-desktop-testing/). Note: To have this extension in English on gvSIG 2.1 you will need to install a translations update too (at the next version it will be included). From the same Testing gvSIG repository at the add-ons manager you have to install the Translations package (Version 1.0.0-25). We make the usual procedure for changing the symbology of one layer: open the window “Properties” of the layer to which the legend will apply (with right button over the layer name in the TOC of the view) and select the tab ‘Symbols’. Between the different options for legends available, we will see one new legend: “Complex symbology”. We select it. Then, a form will be presented in which we will start to define the ranges and types of the scales to be used in each section. We can add new ranges with the button ‘add‘ (green cross icon) and delete the selected one with the button ‘delete‘ (red cross). In function of the input data the combo will be completed and the bottom panel will be filled with the form needed to fill the specifics parameters of the legend. After this, it is only need to repeat this operation, as many times as ranges needed to be defined for the layer. We click accept and we will see the result. If everything has gone OK, the layer will be changing the legend in a dynamic way, depending on the view scale. Another interesting utility is that in the ranges not covered by the legend, no information will be show, so, we can make the layer “invisible” for non defined scales. 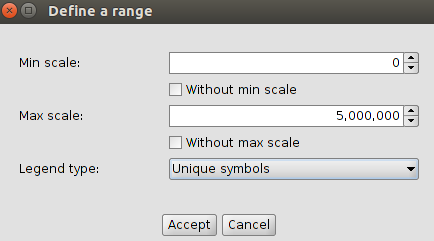 In another post, we will see how to create labels by scale. 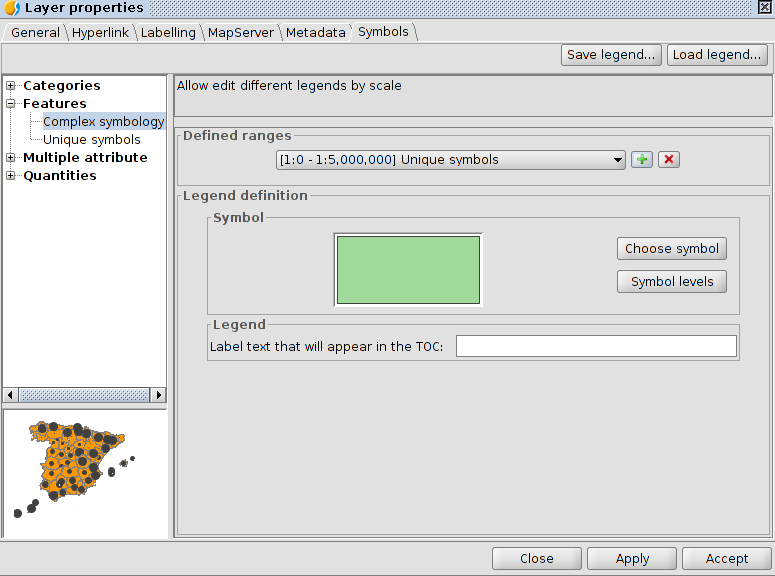 This entry was posted in english, gvSIG Desktop, testing and tagged gvSIG 2.2, legends, scale, symbology. Bookmark the permalink.